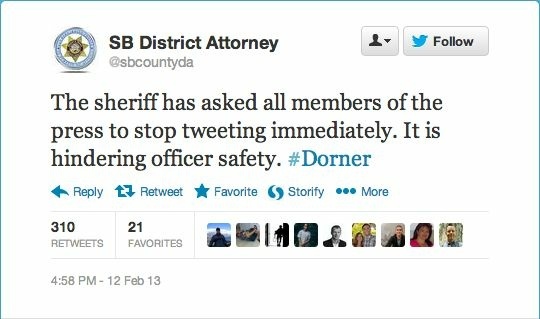 San Bernardino County's District Attorney's Office tweets that the sheriff's department has asked all members of the press to stop tweeting immediately as it could affect officer safety in the search for Dorner. There was a side story to Tuesday's Big Bear manhunt and shootout with suspected murderer and fugitive ex-LAPD officer Christopher Dorner. It was a request — believed to be unprecedented in Southern California — for media outlets to stop using Twitter to track the continuing manhunt, for fear of officer safety. As events played out on local and cable television news, "Big Bear," "SWAT team" and "cabin" made it to the top of Twitter's national trending list. #Dorner was at the top of the trends list in Los Angeles. That prompted the department to issue its unusual request late Tuesday afternoon: Please stop tweeting. Why? 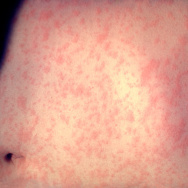 KPCC placed a call to the department to ask why, but hasn't received a response yet. The tweet, and subsequent tweets thanking news outlets that complied, have been deleted. Some media outlets — such as CBS TV affiliates — complied with the request to resist tweeting. Others — like KPCC — did not. Following are some of the tweets in response to the department's request. What do you think of the request? Do you think it was an attempt by a law enforcement agency to manage the media reports of its actions? Or do you think it was a legitimate attempt to protect the safety of its officers in a perilous situation? Sound off in the comments below. In the midst of the flurry of news activity Tuesday afternoon came a request from the San Bernardino District Attorney's office: please stop tweeting. "Big Bear," "SWAT team" and "cabin" had made it to the top of Twitter's national trending list as public interest in the case increased. After posting regularly, the Press-Enterprise stopped tweeting about the manhunt. After a few minutes, they clarified the nature of their coverage, but the public still wasn't happy about their decision. Later, CBS Los Angeles complied with the request. There is a question whether police have ever asked media to stop tweeting about a news event. Even after they stopped tweeting, the Press Enterprise kept updating their site, and TV coverage continued. Media blackouts have been used in the past. In the instance of kidnapped reporters, outlets like the New York Times and NBC have asked other media to refrain from reporting on the incidents, because of safety concerns for the reporter. The San Bernardino DA's office did not reply to a question posed through Twitter.